In searching for "hard information" re the psi-war warning idea of June 1964, I became aware of the work of Professor J.B. Rhine at Duke University in Durham, N.C. Rhine was considered the "Father of Parapsychology" and was clearly the most credible researcher in this often confusing and suspect field. I wrote him a letter in October 1964, which he answered with an invitation to visit him at the university. As luck would have it, the trip to Durham was made possible by having been invited to present a scientific paper at an international conference on materials science being held at that time in Raleigh, N.C., just 25 miles away!After presenting my paper, I visited Rhine in an afternoon before catching a flight home to California later that evening. My purpose was simple. After telling him my idea I naively asked, "Am I crazy?" Rhine replied by showing me his private library and giving me from it a recent book published by Soviet scientist L.L. Vasiliev called Experiments in Mental Suggestion. With obvious enthusiasm he then declared, "Not only are you not crazy, but your idea is urgent! We have been waiting years for a man with your background. Here's the phone, call your wife and tell her you are coming to work with me in our new Foundation for Research on the Nature of Man! "Flattered, but taken aback, I responded, "I can't make such a decision at such a moment. I've barely begun a new career. ""All right", he replied, "but please stay the night at our expense and then attend a meeting at our laboratory in the morning." To that I agreed.Arriving at his laboratory apprehensive, I was greatly relieved to encounter the lab personnel had become excited by a visit of two unexpected celebrities: TV star Eddie Albert and his buddy, folk song singer and actor Burl Ives. I was to learn that this kind of surprise was not unusual for Rhine and he graciously invited the visitors to attend the meeting. I was pleased to have the pressure off and content to silently watch the proceedings from a corner in the back of the room. Is there anyone in your organization who would be interested in my story about meeting J.B. Rhine in late November 1964 and the project we agreed to work on together? Does your archival history contain any of our correspondence? If not, would you be interested in having a copy? What a surprisingly wonderful and synchronistic response! I was that young singer! So, you were there in the lab audience at that time! It shocked me to be asked by JB to sing the "Song of the Volga Boatmen." I didn't know he knew I sang, let alone that particular song!, but it was a never-to-be-forgotten experience. I had come to see JB at his invitation to discuss an idea that I'd had the previous summer, which had nothing to do with my then career as a nuclear materials scientist. In fact, it had military implications and my question to him was, "Am I crazy?" During that first meeting he said something like, "Not only are you not crazy, but the issue you describe is urgent! Clearly you have a calling. We have been waiting years for someone with your background. Here is the phone, call your wife and tell her you are coming to work with me." And then he gave me two books by Russian authors: L.L. Vasiliev and Nikolai Khokhlov, both of which profoundly changed my life. When I told him I'd only just started my scientific career and couldn't make such an abrupt new decision, he invited me to stay overnight at his home and then attend his laboratory the next morning. When we arrived at his lab that following day I was relieved to see that the lab personnel were preoccupied with Ives and Albert and that the spotlight pressure was now off me. I could simply be an observer in the back of the room. Do you remember Burl's words after I'd sung and JB then asked him to sing? "Are you kidding? Not after that guy!" I'll never forget how Burl helped me pull the boats while he bounced up and down, pretending tugging gestures as I sang…. :) Ives and Albert then took me to lunch for another memorable experience. I look forward to continuing this correspondence. I have a hunch our correspondence will be loaded with more interesting surprises!--and do not believe this mutual discovery is mere happenstance. After JB sent his November '64 telegram, he sent me two Kipling poems, one of which you allude to below. I've always treasured that gesture. They were: "IF" and "The Explorer". In doing a Google search for your mother's book, I was surprised to learn that that title is claimed by Louisa E. Rhine!?? Is Louisa your mother and therefore JB your dad?!! Perhaps this could yet be the "GREAT DAY", JB referred to? If you have opened the second blog link re the 'Carmel Beach Challenge' that I sent earlier, you will know that our project did not mature. There were at least two reasons for this. The most important was a "Mormon complication" [see attached 2nd poem Night + commentary for my oldest son]. The other was an impasse in JB's and my correspondence. He systematically sent me all his books so that I could be up to date on his background and latest thinking. I was willing to get this under my belt, but with misgivings. The most critical was his refusal to answer, let alone acknowledge, my specific question about the Zener Card approach to studying psy. JB insisted that I experiment with my young family (wife and 5 children) using the Zener Cards. But, I was reluctant to do this when I learned that this technique seemed lethal to above-chance performance. I asked several times if there was any evidence of talented persons recovering their statistically above-chance performance once they lost it. If there was no such evidence, I was unwilling to risk involving my family. One of my colleagues later explained that I'd focused on the Achilles Heel of that technique and Rhine could not risk losing my cooperation by answering it truthfully. I was never to learn the truth of this assertion. My last contact with JB was in spring 1978, while working on a solicited USAF proposal with the Eyring Research Institute in Provo, Utah. I was asked to re-contact JB to refresh his memory of my original idea and to invite him on board the project. He didn't remember my name, but did ask "Are you the singer?" Two last items before closing this message. It may not mean anything to you out of the larger context, but here is one more blog link that belongs between the two links sent earlier: http://orthodoxodyssey.blogspot.com/2009/01/23-dec-64-dream-from-todays-perspective.html. On the subject of dreams, I had only begun remembering and recording my dreams just two or so weeks before meeting JB in late November 1964. This was the result of reading Hugh Lynn Cayce's newly published "Venture Inward", which contained suggestions for recalling and processing dreams…. This was something JB and I never discussed. The last item was a military experience I was not at liberty to explicitly mention to JB. This was my clandestine experience in Berlin less than a decade earlier. You may be interested my Amazon review of the print documentary by British historian David Stafford called Spies Beneath Berlin. This review soon flushed out others who contacted me personally. Instead of a second addition, which Prof. Stafford asked me to contribute to (since I was the first person he'd met that was actually at the Berlin site), it eventually morphed into a 2011 British TV film documentary by the same name. If this is of any interest to you, I would be pleased to send you a post-production copy of the complementary DVD. PS. It occurs to tell you that one of the reasons why JB was eager for my participation at the FRNM was that I work with N. E. Khokhlov, who wanted to study under JB. However, because of my subsequent correspondence with Khokhlov, JB never allowed him to come to Duke or FRNM. (This is hinted at in the last stanza of "Pilgrim", which was written after JB's telegram.) Khokhlov eventually became a professor of psychology at a college in Southern California before his death in 2007. There is more to this story only if you are interested. The "more" to the story will continue here on the Rhine blog. 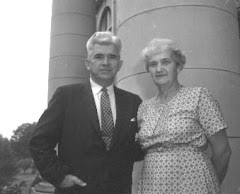 *Brief bio of Eugene N. Kovalenko, Ph.D.
Having been born in Los Angeles in 1933 and raised in the Phoenix, Arizona Mormon society and culture, Eugene's conscious life began in 1953 during the Korean War, when he joined the US Army to learn Russian, his Ukraine-born father's native tongue. For Eugene, that military experience began his life work in learning to become human: soldier, interpreter, singer, intelligence agent, student, engineer, scientist, seeker, poet, writer, inventor, manager, entrepreneur, teacher, husband, father, grandfather, great-grandfather, conversationalist, traveler, actor, visionary, wanderer, wonderer, believer, skeptic, philosopher, dreamer and dream worker. See: http://www.eugenenkovalenkophd.com/ [Lower RH corner] for facts concerning family, education and professional activities.